Indian Artist Asa Battles' illustrations entich the book. The greatest loss the Spanish suffered in the New World happened at the forks of the Platte River. 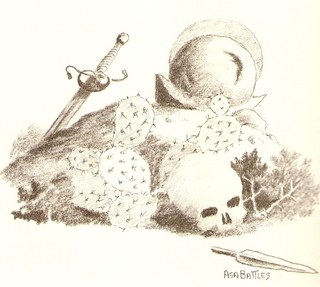 Scottish Artist Alfred Jacob Miller dressed Jim Bridger in armour at the fun trappers' rendezvous. The Oregon and Mormon trails carved a scar across the prairie. Before the Mormons left Winter Quarters, 600 Saints lay in their graves, 150 of them children. 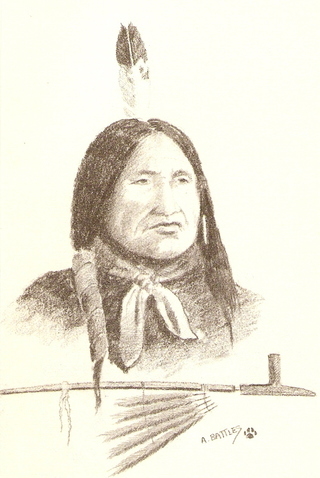 Lakota leader Spotted Tail had to turn from fighting to passive resistance. 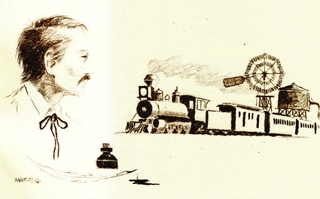 Poet Robert Louis Stevenson wondered how settlers could exist in such an empty land. 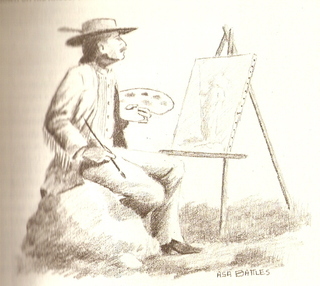 "A beautifully written account of the adventures and hardships of some of the more colorful people who moved or settled along the Platte. . . . Each chapter is illustrated by one or more appropriate sketches by Asa Battles, which add much to the book's flavor. A very ample bibliography includes journals and memoirs of the subjects as well as early newspaper items." The river the Indians called the Moonshell is, for the most part, a quiet river, an unobtrusive river. It is not deep, nor fast, nor useful for navigation. It does not transform the countryside through which it flows, but nestles gently into it, a partner with the land rather than a destroyer. Its dual beginnings run swift and clear where they rise in North and South Parks of the Colorado Rockies. But when the water escapes the high country in two streams, to meander across the plains of northeastern Colorado and southeastern Wyoming and meet again in Nebraska, it relaxes into the land. In fact, it is so truly a part of the land that it is as much sand as water. Its seldom generous currents are soon divided into separate channels by ubiquitous and ever-changing sandbars. The more resistant patches of soil form numberless islands, whose stubby growth dots the river with green for most of its length, reiterating the union of land and water. It is a western river, taking its character from the plains through which it winds. Open to the spreading sky, subtle in color, quiet but pervasive in its influence. Soft, low banks provide only slight hindrance to swollen spring waters, which, before the days of dams and reservoirs, simply spread themselves across the prairie for a mile, or two, or more. Yet in the dry seasons the river could nearly disappear in some sections, shrink to scum-topped pools in others. White explorers, of more practical than poetic eye, renamed the river the Plate, for flat. In the eyes of these early travelers, it was an inconsequential, undependable and unuseable river – scarcely worthy of the name. Yet it became the most important water-course in the entire area west of the Mississippi. This then, is the irony of the Platte. It had no mighty currents to gouge the land like the Snake and the Colorado, no power to lift barge and steamboat like the Mississippi and the Missouri, no opportunity to shape the edge of nations like the Red and the Rio Grande. Yet the half-formed footprints along its sandy banks attest to an incredible history. It was the Platte that saw French and Spanish kings in conflict. The Platte that saw the trappers' caravans, the missionaries' lonely campfires, the emigrant wagon ruts, the graves of the Mormon handcart brigades, the telegraph's whining wire and the railroad's shining rails. It saw the Sioux, Cheyennes and Arapahos first reach a hand in friendship and then raise a closed fist in defense of their existence. It saw the soldiers sent to battle, the scientists sent to explore, the dandies and adventurers who came just for the fun of it. It gave men gold. And women grief. Platte history, like any history is in the stories of the people who trudged its banks and settled its valleys. Their experiences, taken individually, tells us what it was to touch the West and be touched by it. Taken collectively, they tell the compelling drama of life that flowed with this enigmatic river. "Peterson's ability to show the people and the beauty of the Platte, while giving the reader a real sense of being on the scene makes this publication hard to put down." With families like the Kellies settled along the river's length, Platte River history entered another era. 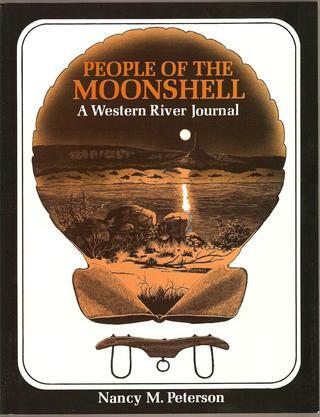 The Moonshell days were but a glowing memory to be passed down the generations in tribal legends. 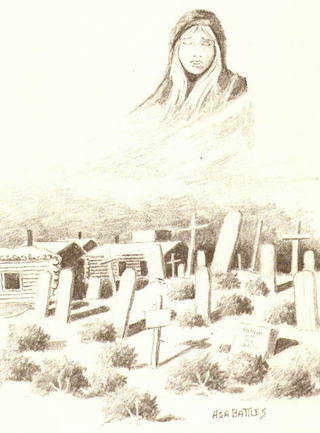 The Pawnees and Cheyennes were gone – pushed down to Indian Territory to die off in pitiful numbers. The Sioux were gone – pushed north to reservations, with war chief and peace chief alike capable only of passive resistance to the white man's dictums. Luna Kellie lived in fear of Indians, but she did not see one for 20 years after she came to Nebraska, and that Indian she met in the metropolis of Omaha. The native plants were uprooted from the land by the plow blade and the free-flowing sheets of prairie grass became patchwork quilts of corn and wheat, nearly squared into sections by brown strips of road. Small groups of antelope and deer still fed in the evening, but the herds of elk were largely gone. And the masses of bison that had shaken the earth with their passing were so rare that in 1879 Luna Kellie ran to the road to see her first buffalo. She saw a pair of them yoked in tandem with several oxen, pulling a freight wagon. The presence of Spanish swords was long forgotten, and the flavor of French influence lived only in an occasional name. Most of the mountain men who mapped the Platte's drainage had gone to the grave. Those who lived were curiosities. The dudes and dandies had turned to other playgrounds, the scientists and soldiers to other fields of conquest. 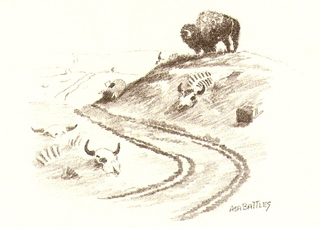 The works of the artists and writers who had experienced the early days of the Platte remained, as did the settlers. Foreign and natural-born, on farms, ranches and mining claims, in villages and towns, they worked to build a good life for themselves and their children –- some of them conscious, some unconscious, of the fascinating assortment of people who had walked before them along the Platte. "... one of those rare treasurers that will find a favored place in that section of your bookshelf where you keep the books that have a special meaning... an immensely readable book."